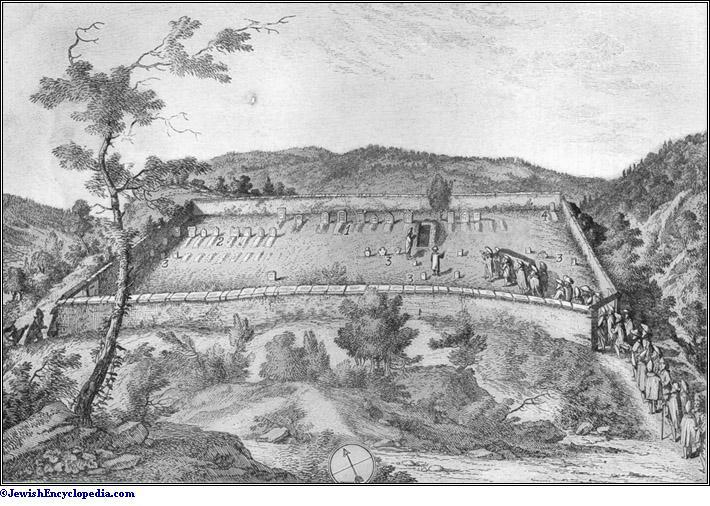 The ancient law (see Burial) required the burial-place to be at least fifty ells distant from the nearest house (B. B. ii. 9); the place for the cemetery was therefore selected as remote as convenient from the city (Luke vii. 12). 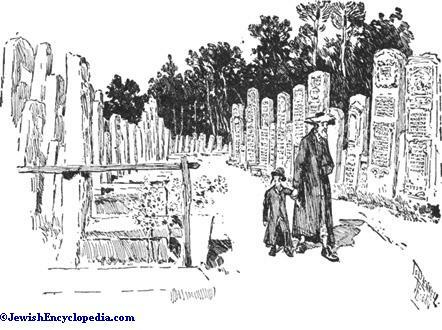 In Talmudical times the tombs were either in caves—hence , frequently the name for a cemetery (M. Ḳ. 17a; B. M. 85a; B. B. 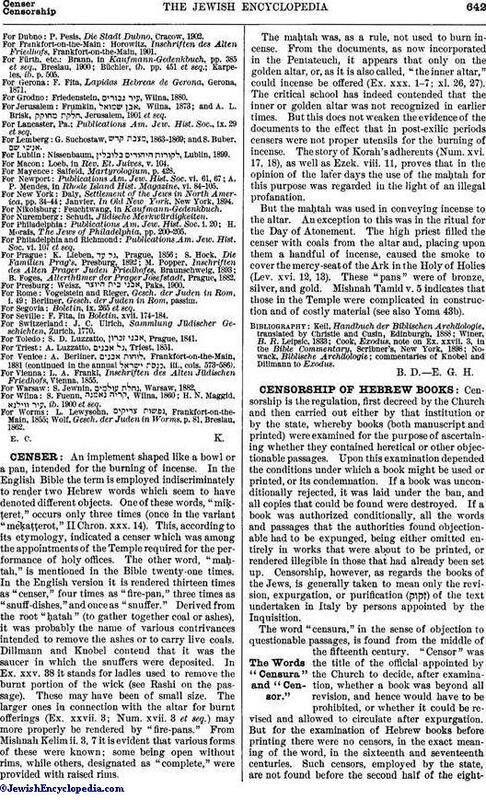 58a)—or hewn out of rocks; and the site was marked by a whitewashed stone ( , Shek. i. 1) to warn passers-by against Levitical impurity. 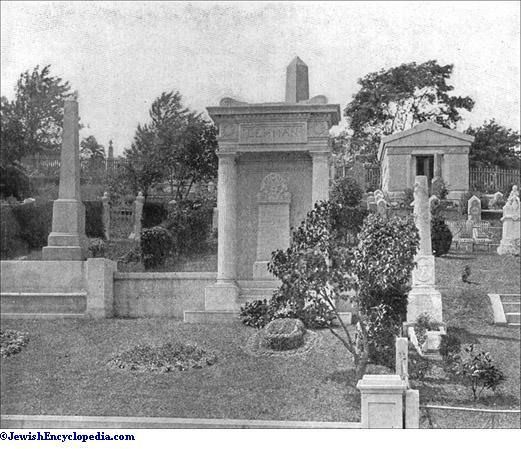 Mausoleums, Monuments, and inscribed Tombstones, though not unknown, were exceptional. 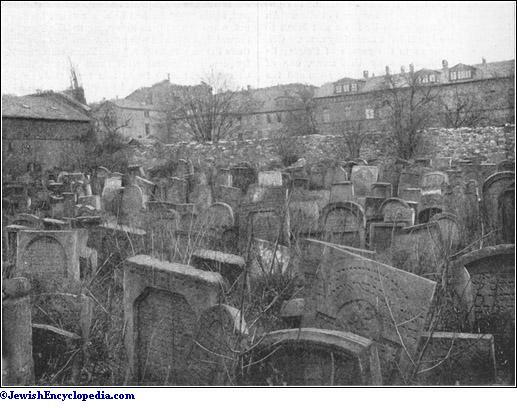 In the Middle Ages the Jewish cemetery was as a rule situated at the extreme end of the ghetto, the hospital and other communal buildings being frequently erected in the neighborhood. The limited area often made it necessary to inter bodies above those previously buried; and thus the rule became general to leave a space of six handbreadths between them (Ṭur Yoreh De'ah, 363, after Hai Gaon, and Sifte Cohen to Yoreh De'ah, 362, 4). 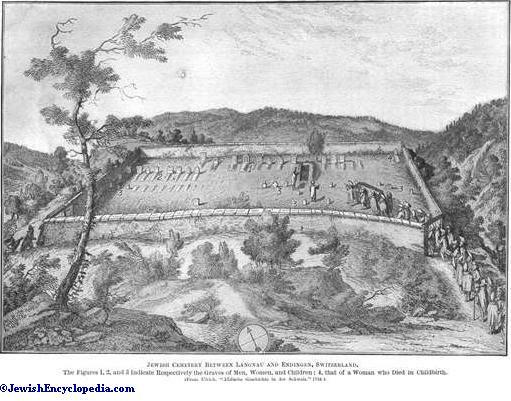 The Jewish cemetery in London in 1285 was within the city walls and was surrounded by a protective wall (Abrahams, l.c. p. 78), as was one in Rome (Berliner, l.c. i. 14; compare idem, ii. 62). At times, however, the cemetery was at a great distance from the town (Berliner, l.c. ; Abrahams, l.c.). 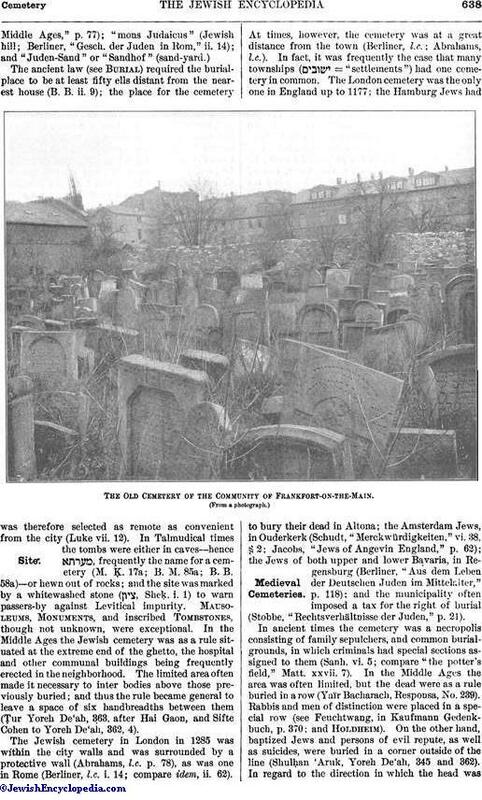 In fact, it was frequently the case that many townships ( = "settlements") had one cemetery in common. 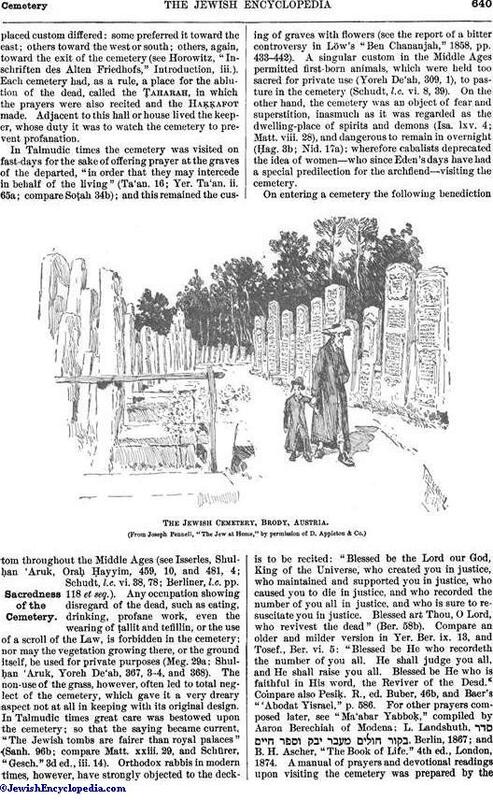 The London cemetery was the only one in England up to 1177; the Hamburg Jews had to bury their dead in Altona; the Amsterdam Jews, in Ouderkerk (Schudt, "Merckwürdigkeiten," vi. 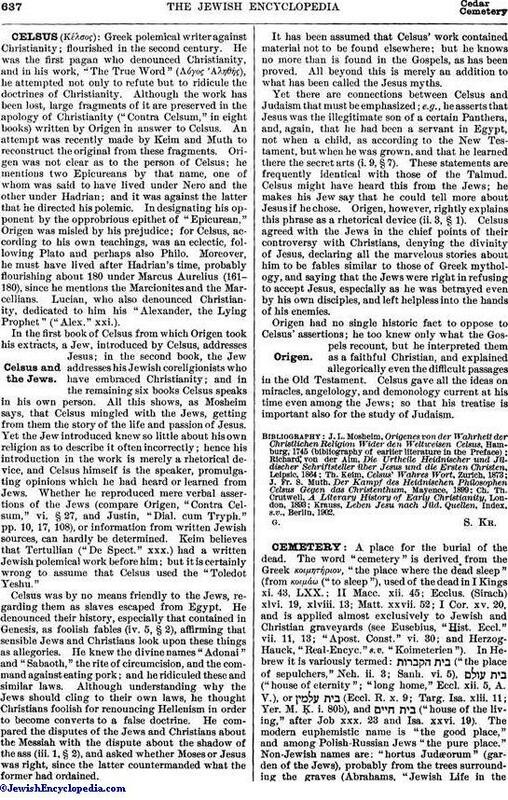 38, § 2; Jacobs, "Jews of Angevin England," p. 62); the Jews of both upper and lower Bavaria, in Regensburg (Berliner, "Aus dem Leben der Deutschen Juden im Mittelalter," p. 118); and the municipality often imposed a tax for the right of burial (Stobbe, "Rechtsverhältnisse der Juden," p. 21). On entering a cemetery the following benediction is to be recited: "Blessed be the Lord our God, King of the Universe, who created you in justice, who maintained and supported you in justice, who caused you to die in justice, and who recorded the number of you all in justice, and who is sure to resuscitate you in justice. Blessed art Thou, O Lord, who revivest the dead" (Ber. 58b). Compare an older and milder version in Yer. Ber. ix. 13, and Tosef., Ber. vi. 5: "Blessed be He who recordeth the number of you all. He shall judge you all, and He shall raise you all. Blessed be He who is faithful in His word, the Reviver of the Dead." Compare also Pesiḳ. R., ed. Buber, 46b, and Baer's "'Abodat Yisrael," p. 586. For other prayers composed later, see "Ma'abar Yabboḳ," compiled by Aaron Berechiah of Modena; L. Landshuth, , Berlin, 1867; and B. H. Ascher, "The Book of Life," 4th ed., London, 1874. 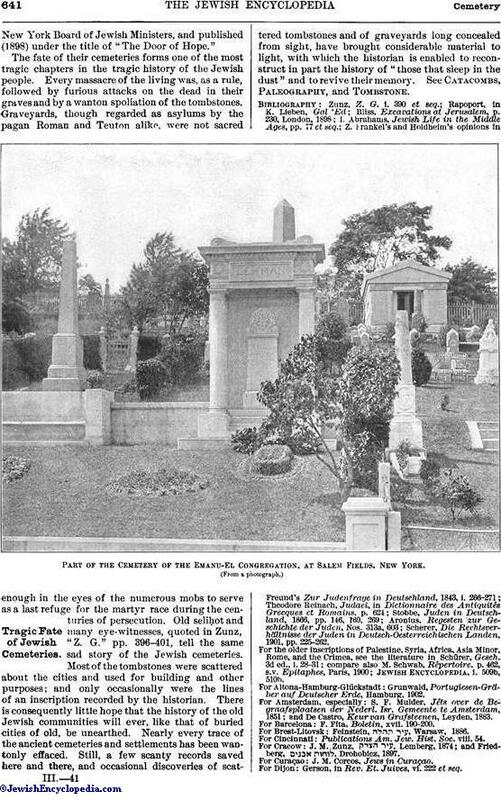 A manual of prayers and devotional readings upon visiting the cemetery was prepared by theNew York Board of Jewish Ministers, and published (1898) under the title of "The Door of Hope." For Brest-Litovsk: Feinstein, , Warsaw, 1886.
and Friedberg, , Drohobicz, 1897. For Grodno: Friedenstein, , Wilna, 1880.
and A. L. Brisk, , Jerusalem, 1901 et seq. For Lublin: Nissenbaum, , Lublin, 1899. For Presburg: Weisz, , Paks, 1900. For Toledo: S. D. Luzzatto, , Prague, 1841. For Triest: A. Luzzatto, , Triest, 1851. For Venice: A. Berliner, , Frankfort-on-the-Main, 1881 (continued in the annual , iii., cols. 573-586). H. N. Maggid, , ib. 1900 et seq.